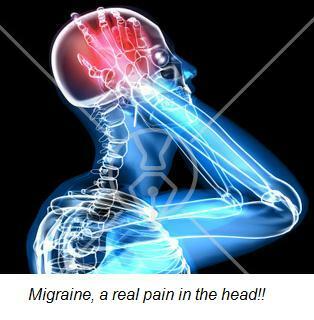 A migraine is a severe, excruciating pain, lasting for hours or even days. In most cases, the symptom often precede / accompanied by a kind of sensory sign such as flashes of light, tingling in the arms and legs, vomiting, sensitivity to light and sound etc. Case History: The patient has been suffering from Migraine since the age of 5 years. Stress was the likely cause that triggered a kind of emotional stress, due to frequent argument and fisticuffs between the parents. As a result the patient, who was a child at that time, having witnessed these flare ups, grew up in an hostile environment not conducive to a peaceful living background. Here we have to analyze the patient’s psychological state of mind which was in a highly disturbed state. Again Stress is the likely cause which subsequently converted to migraine over the period of time, is also linked with improper and untimely food intake or consuming too much junk food, child often being neglected due to mother being traumatized etc. The patient has sought treatment regularly in her native Germany for the Migraine where she has undergone MRI scanning and other check-ups and continued on medication with little success. Later having moved to Abu Dhabi, she was advised by a collegue to try Kerala Ayurveda Therapy which was often in the form of oil head massage which gave her temporary relief but the symptoms remained intact. Her condition aggravated further due to stomach ulcer, blind spots, lack of sleep etc. First of all after seeking Almighty Allaah’s blessings, The patient was advised to have her food early. Later in the evening, the patient was made to sit so as to carry out physical checks on nerve activity to ascertain the right place to administer Hijama. After the hijama therapy was over, the patient was given a head massage using herbal oil for 20 minutes which proved to be very beneficial. The patient showed a sense of relief and told me that she felt as if a big boulder was removed from her head. Al Hamdu Lillaah, It is Allaah who decrees the cure. After a period of two months, the patient had a recurrence of the migraine and on my second visit the same therapy was applied. Al Hamdu Lillaah ever since the second therapy was administered the patient has fully recovered and no recurrence of migraine so far. In her last communication with me in March 2010, she has fully recovered from migraine and feeling fine. Our thanks to Dr Nazri Nizar from Colombo, Sri Lanka for sharing the above post. If you have any questions for Dr Nizar or indeed have been treated by him and want to leave him a testimonial, then please do so via a comment* below.